The latest film to take place in the magical wizarding world (of Harry freaking Potter!) has hit the big screen. And even though I have literally no clue whatsoever what Fantastic Beasts and Where to Find Them is supposed to be about—because the plotline is somehow derived from a textbook referenced within the Harry Potter series’ plotline—I am incredibly excited about it. Why? Because there was a time that I recall very fondly during my childhood when I creeped around the house wearing a bathrobe over my clothes at all times, with a wooden dowel (i.e. magic wand straight from Ollivander’s) in one hand and whatever volume of HP I was rereading for the 3rd time at that moment in the other. I outgrew that bathrobe by about the 5th grade, but oddly enough, as I grew older, I only managed to find more and more people like me… generally rational human beings who found incredible pleasure in a luxuriously easy read that transported them to a magical world far away from their own. A world made only more magical by British accents and extensive depictions of captivating foods. Since we’re all adults here, let’s kick this party off with a spirited, candy-inspired cocktail. Ladies and gents, I present the Fizzing Whizbees Levitator. And for a non-alcoholic sip, you can also whip up a few pints of Butterbeer. Serve your beverages alongside a cauldron full of candied bacon “wands” for a salty-sweet snack. 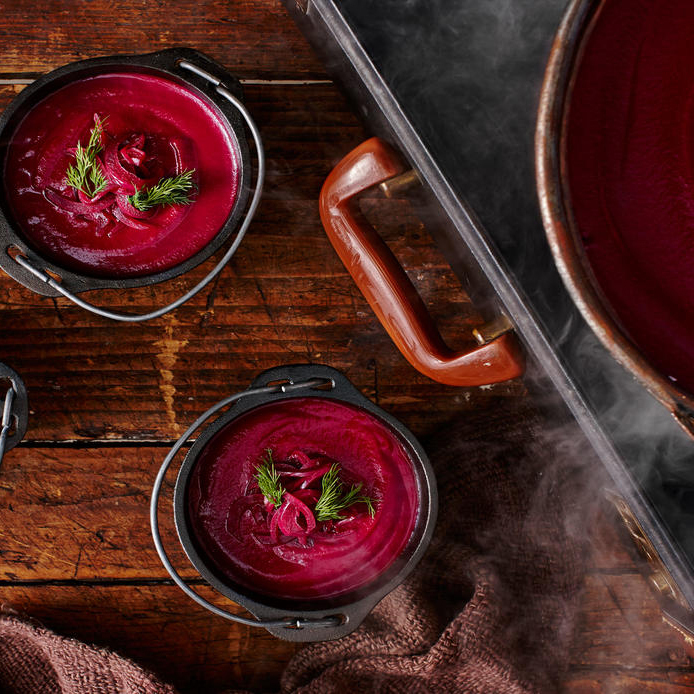 For the main course, a hearty soup and sandwich combo: our fantastic Beets, Baggage, and Brew Stew served with a platter of stacked corned beef sandwiches (that are apt to rival Mrs. Weasley’s) for dipping. And to finish the meal, I’m thinking all the chocolate. Put out a platter full of cockroach clusters, cauldron cakes, and sorting hats for your fellow Potter nerds to enjoy and get hyped on sugar/caffeine with. Because let’s be real, it’s not as easy to make it through an entire movie in a dark theater, especially after having a drink and eating a fairly hearty meal, as it used to be. I’m refusing to read a plot summary about the Fantastic Beasts movie before going to see it, because I want to be completely ignorant to what’s going to happen… I’ve never experienced that going into a Harry Potter flick (die hard fan that I was), and it seems like a fun adventure. I have my fingers crossed and I’m feeling confident, because even if this movie is a complete disgrace to J.K. Rowling’s wizarding world legacy (I honestly don’t think it will be, but you never can tell), at least I will have an excellent meal in my belly and can rest easy knowing that when it comes to pulling off an exceptional Potter party… I still got the magic.